Made with just just 4 ingredients – bananas, oats, peanut butter and jelly, these cookies are meant to eat warm right out of the oven for a fun spin on my 3-ingredient healthy cookie recipe. I’m so addicted to making these cookies. Whenever my bananas are over-ripe, I whip up a batch which takes only minutes. These are best when the bananas are super ripe as their natural sweetness is what’s used to sweeten the cookies. Keep in mind they aren’t crisp like a dessert cookie. Instead these are moist and chewy and best eaten warm, right out of the oven. They are great as an afternoon snack or healthy enough to have for breakfast if you wish. You can easily make half the portion with just 1 banana if you want to make less. I’ve made them with walnuts which tasted like banana bread, I’ve tried them with chocolate chips which so yummy! 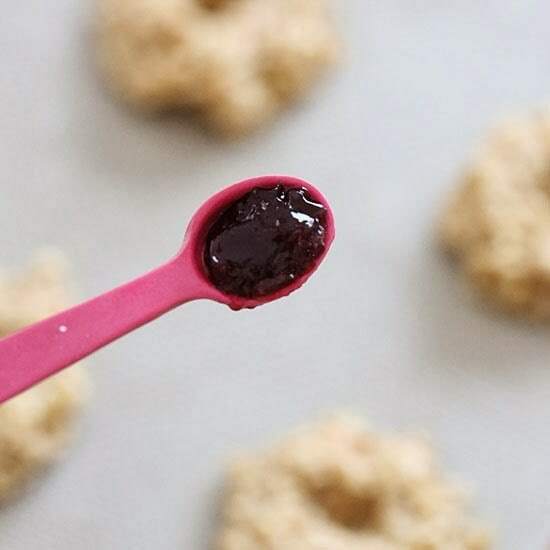 This time I decided to switch things up and see what happens if I add some chunky peanut butter to the batter and top them with reduced sugar jelly – yum! 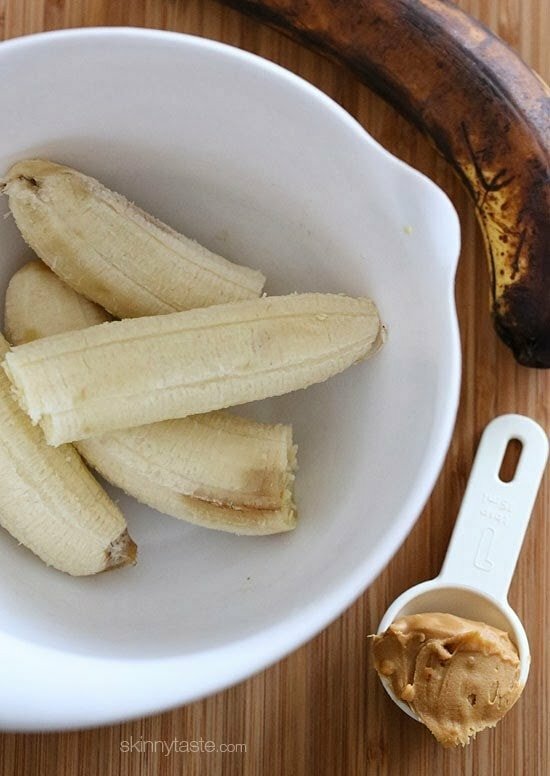 Combine the mashed bananas and peanut butter in a medium bowl. Add the oats and mix until thoroughly combined. Place batter by tablespoons (little more than level) on the cookie sheet, making an indent with the back of the measuring spoon. Repeat until you have 16 cookies. Bake 15 minutes or until golden. Remove from oven and top each with 1/4 teaspoon jelly. 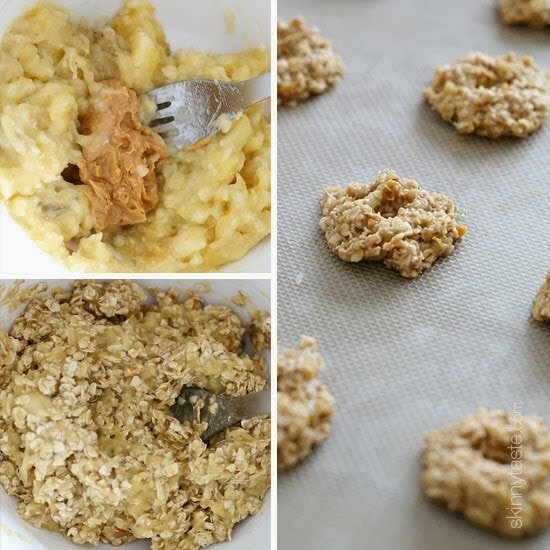 Delicious cookies that are quick and easy and use up ripe bananas in a hurry! I will be keeping this recipe around. I made ones with walnuts and chocolate chip last week and we loved them. Will try these ones today. Thanks for the delicious and healthy recipes! My toddler loved having cookies for breakfast! We will definitely make these often. How long can you store these for? 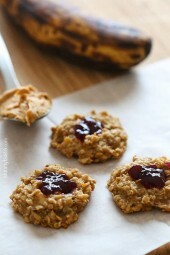 I love PB&J so these cookies are fantastic! So easy. I would like to make these cookies but I do have a question. Could I use rasisin and figs? Absolutely love these! I did make them with gluten free oats and they taste great. I froze most of them, pop them in the microwave to soften them up and they are a great breakfast. Good for an afternoon sweet treat as well! Thank you so much for sharing your gifts! You say that they have to be eaten straight from the oven. Is it possible to keep them in the fridge or even freeze them. Thanks for all your great recipes. Hello what amount of the cookies is the above calorie count for? A favorite to make in my kitchen when I have an overripe banana! Such a great snack and if you don’t put the jelly on, the cookies will last longer in the fridge. Great snack and always satisfying! I topped mine with blackberries instead. Even healthier! ???? Oh my goodness whaaaaaat, for sure making these this weekend! I forgot to say that I freeze really ripe bananas just to be able to make them at a minute's notice. It is a great way to use my homegrown bananas. Gina, these are so good! Sometimes I eat them for breakfast on the go. My granddaughter loves them in her lunch box. I feel like such a fun grandma! These are an amazing diet cookie! I have now made them twice and love them. I use a no sugar homemade jam since store bought jam is so high in sugars. To those that posted these are not a cookie, no they are not, it's a low cal snack to curb to sweet cravings. It works! Thanks. I made them last night and they were absolutely AMAZING! My husband, which by the way is a cookie expert 😉 , thought they were incredibly delicious. Thanks a bunch! I usually make something like this when I have bananas I need to use but I haven't ever tried them with PB&J. Can't wait to try them tomorrow! Thanks! I just enjoyed these with an espresso for a perfect afternoon snack. Thanks so much for all your delicious, guilt-free recipes! I made these this morning they were very easy too make a tasted GREAT!!! I made them last week and added mini choc chips. They came out so good and my hubs even loved them. I am making them again tonight or tomorrow and will omit the choc chips. I used Polaner All Fruit with Fiber Seedless Rasberry. Yum! Ohh and I meant to add I added 2 teaspoons ground flas seed. I also threw my quick oats in my blender for a few seconds first. These are so good!! Would they freeze well? Can you use Instant Oats if you don't have Quick Oats? Also, I have no jelly! Doh! Made these tonight, they are delicious! Looks awsome! Have to try it out! Just threw in a batch w almond butter, coconut, craisins, vanilla extract and cinnamon! These sound absolutely delicious. I adore the minimal ingredients! Long-time reader (or should I say, "lurker" here!) I believe this is my first comment but I wanted to thank you for sharing all of your wonderful recipes with us. I love your website and I look forward to your cookbook. Hi Gina – Do you prefer a certain brand of jelly and penut butter? I made these tonight. They were not that sweet. I should have used more ripe bananas, but for 1pp each I'll eat them. Made these with my 3 year old daughter tonight. They were fast, easy and DELICIOUS! Cannot wait to try these! Pregnant and craving PB&J but I have celiac disease – these are perfect! I made these while my little ones napped today. I added a couple tablespoons of semi sweet chocolate chips. Delish! I have to try this. now. I have these in the oven right now. I always have Teddy Chunky pb with flax for some extra goodness. What a wonderful idea!! I love that they are so easy to make and use so few ingredients. I think I'd have to add some chocolate to these, but I do that to my bowl of oatmeal as well. Also like the idea of one of your commenters above to freeze ripe bananas until you're ready to use them. Brilliant! I loved these cookies! I ate a whole batch in one seating 🙂 i said, it's not toooo bad. Oatmeal, bananas, a little bit of PB can't be that bad? I made them again last night and added some raisins. my first post – and i made these cookies last night on a whim bc i had an overripe banana! my boyfriend and i have been cutting calories and watching portions, and these are a great way to start the day! today i had my two cookies with a yogurt – so satisfying! even my coowrkers and mom liked them! thanks so much for your post – and website in general – i have begun to rely on your recipies to inspire my weekly meal plans and look forward to making the loaded sweet potato on thursday!! I only have regular oats and cannot get out to buy quick oats. Will this work with the regular version? Sounds yummy (and the idea to use pumpkin instead of banana is a great notion too, maybe with spices?). Thanks Gina! Just tried it, awesome recipe ! I have to try this. Love cookies, oatmeal and peanut butter! Thanks for sharing! I must try this one. I love cookies and so are my friends. True, these are not in the traditional cookie sense. Texture is very soft and a bit odd, but if you are looking for a guilt-free sweet treat, these are great. The banana sweetens them a little, the jelly sweetens them more. Not sweet enough? Add more jelly or go all out and dip in melted dark chocolate, add a few choc. chips to them before baking, coconut, raisins etc. It's a great base recipe that you can modify and make as healthy or unhealthy as you want. Wonder how these would be with pumpkin instead of banana. 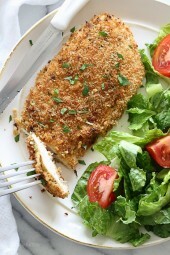 I added 2 tbsp of flax seed meal to the original recipe for a healthy boost and added texture. Probably could have added another tbsp or more. Really? You like these? I made some today and I think they are strange tasting cookies. In my world cookies are sweet, these are not. Yes, they are healthier than real cookies but they have to have taste and these border on cardboard. the bananas really need to be ripe (some brown on skins) to give them sweetness. These are meant to be a healthy snack, not a dessert cookie. I have tons of real cookie recipes if that's what you want, but I wouldn't call them healthy. I did and added cinnamon for a little more flavor. Do you store the extras in the fridge? oooooh these look so delicious and easy! Thanks! Definitely trying these. Look amazing! OMG! This is a genius idea! My kids are banana and PB fanatics. I usually make them banana "boats" where I carve out a sliver of banana down the middle and fill it with PB and then top it with a few raisins. They love it. This sounds like another great idea. I can't wait to try it! I am loving these recipes. I didn't have any quick oats on hand but did have WW oats with brn sugar. OMGosh.. they were so good. I added a point 'cause I wanted my 2 right now and didn't want to calculate the points. 🙂 I am going to try grating some orange zest with the original recipe and use SF apricot jelly. I have to be careful, I could make these more than the original 2 points then I am defeating my purpose. thank you for such a great recipe. I used almond butter and a dash of cinnamon and I still really enjoyed them! My family is not big on bananas. Is there something I could substitute and still have this turn out without adding calories? I don't mean to be rude, truly I don't. However, if a recipe has only four ingredients and you don't want to use one of them, then I would suggest that this isn't the recipe for you. I have heard of some people substituting pumpkin for banana. Yum…I've made these several times and what I like best is to add 3 to 4 blueberries on top before putting in the oven. I found that trying to mix them in makes for a messy sticky cookie after its done. (even on a silpat) Instead I just push them into the cookie and they come out delicious! I think instead of jelly I may go for mashed up strawberries with the peanut butter in this version! I'm making these today! When I have over ripe bananas but no time to use them, I freeze them until I do have time. Right now I have quite a few frozen ripe bananas! Thanks for this recipe. My granddaughters will love having these for an after school snack. How did they come out with the frozen bananas? I have some in my freezer too and I want to make them today. If you're using regular oats, instead of the quick cooking…I was told that you put it in the food processor and pulse a little (not until it's powder, but just break it down a little.) I hope that helps! I have a batch in now that I did this method, they seem fine! I used old fashioned oats and didn’t put them in the food processor and they turned out great! These sound like a great breakfast to change from my boring oatmeal/cereal, definitely going to try soon! I just made these & they are easy & very good. I used smooth P.B. because that's what I had but I think chunky would be better. Added some raisins. Next time I add some chopped pecans. Thanks for a great recipe! I added a little cinnamon. call me crazy….. yummy! Could you use PB2 powder? Why not! I would add a little more so you can taste it. Does it change the point values if you use the powder? Yes, it would be less, don’t have the exact difference off hand. Has anyone tried nutella instead of peanut butter (or some other nut butter)? just made 'em and they are perfect…even approved by my boyfriend! YEAH! I was just wondering how to store them, and how long they keep? You have to eat them right away, so make less if it's just you. 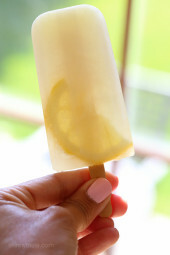 Totally going to make these with the bananas I have that are getting too ripe!! My kids will l.o.v.e. these! I swear I go through 2 Costco size jars of PB every 2 weeks! So perfect as I also have two over ripe bananas! I have your chocolate chip breakfast cookies every morning, but I have to try these!!! Banana's are not quite ripe yet, so I have to wait. This was meant to be…I had three ripe bananas thinking I need to cook with these today and your FB post popped up! They are great! Kids love them and husband too! Thank you for great timing! Gina, you are awesome! I just made some of the chocolate chip ones last week (not for the first time…lol), and now I have another banana that is ready to go. I was going to make the chocolate chip ones again this morning, but now I'm going to make these instead! I love PB&J, so I'm sure they will turn out great. I only have creamy almond butter and blackberry jelly on hand (which are my favorites anyway), so that's what I'm going to use. 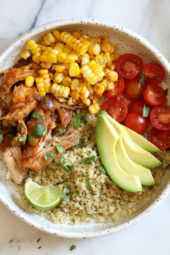 Thanks for another fun and healthy recipe!! This sounds awesome, blackberry is my fave too. I only have the 5 minutes oats.. would those still work? and 1/8 c. of brown sugar, topped with orange marmalade. WOW, had it with English tea. So good!